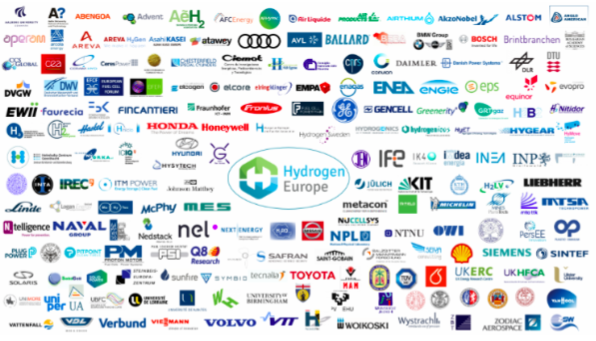 Hydrogen Europe represents the European industry, national associations and research centers active in the hydrogen and fuel cell sector. The association partners with the European Commission in the innovation programme Fuel Cells and Hydrogen Joint Undertaking (FCH JU). We are promoting hydrogen as the enabler of a zero emission society. Hydrogen Europe is the leading European association working to make Fuel Cell and Hydrogen (FCH) technologies an everyday reality in Europe. With over 100 members, the Association represents companies of all sizes as well as national and regional Associations from across Europe in the field of FCH technologies. Hydrogen Europe Industry is the leading European association promoting hydrogen as the enabler of a zero emission society. With over 100 industry members, the association represents companies of all sizes. Europe and N.ERGHY members are responsible for shaping the annual funding calls for proposals until 2020. In advocacy, Hydrogen Europe serves as the industry’s reference point and the single voice of the hydrogen sectors amongst EU decision-makers. This work is carried out by the association’s advocacy staff and the Advocacy Taskforce which is composed of and driven by our members. Hydrogen Europe’s capacity in advocacy has been strengthened in the last year through the inclusion of national and regional associations which provide a two way communication between national and regional decision makers and the advocacy team’s engagement with EU policy makers. The work delivered by the the Advocacy Taskforce is supported and enhanced by the Communications Task Force. This TF was set up in order to align Hydrogen Europe’s members when it comes to key messaging and the dissemination of important information across members and the wider public. Hydrogen Europe Research is the research grouping of the Fuel Cells and Hydrogen Joint Undertaking, a unique public private partnership supporting research, technological development and demonstration (RTD) activities in fuel cell and hydrogen energy technologies in Europe. Gathering nearly 70 research institutions (universities and research centres), we support and promote research interests in the FCH JU and create a framework for cooperation of science and industry in Europe. On May 6th 2014, the Council of the European Union formally agreed to continue the Fuel Cells and Hydrogen Joint Technology Initiative under the EU Horizon 2020 Framework Program. The programme (2014-20) has a total budget of €1.33 billion provided on a matched basis between the EU represented by the European Commission, the European Industry and Research. In 2016, Hydrogen Europe welcomed the first eight national associations as members – the Belgian, Danish, French, German, Hungarian, Latvian, Romanian and Spanish. Today, we count 10 national associations as our members. One of the first joint efforts of this grouping in their work together on the HyLAW project. This project will look into the removal of legal barriers to commercialisation of FCH technologies. but the association is pleased to offer a platform for collaboration and ideas sharing. Latvian Hydrogen Association is a Member of the Hydrogen Europe since 2015.